To make matters worse, Pangol, the youngest and most volatile Argolin, was actually created by the technology at the heart of the Argolis leisure complex, the Tachyon Recreation Generator, and he intends to use the machine to create an army of replicas that can take on the Foamasi one last time, wiping them out for good. The Leisure Hive marked the dawn of a new era for Doctor Who with incoming producer John Nathan Turner committed to radical change. Out went the previous seasons' silliness - a good move - and in came a commitment to intelligent drama and high production values - also good. 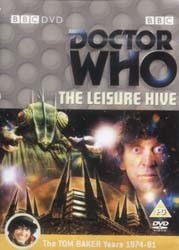 Unfortunately, The Leisure Hive arrived on our screens as something rather dull and slow. Despite some very short running times, each episode feels like it lasts an eternity as beige characters walk around beige sets in beige costumes speaking beige dialogue. Even the excellent directing from Lovett Bickford can't rescue a script that lends a whole new meaning to the term 'dull as ditch water'. On the plus side, this disc is chock full of excellent extras. The 5.1 audio mix is better than many modern movies, the A New Beginning feature tells the story behind the production so well you almost start to want to re-watch it, and the Synthesising Starfields mini documentary, about the show's new opening credits, is also highly informative. And there's the problem. The extras are more interesting than the main feature which makes giving an overall score to the release quite difficult. The extras clearly merit 10 out of 10, The Leisure Hive episodes, however, don't even come close which rather undermines the disc's reason to exist. Still, it could be worse - the next Doctor Who DVD release is Ghost Light.